Hotel Overview The Noy hotel offers to its guests 10 rooms and 3 suites. Their stylish furniture, combined with the warm and tender colors of the interior, predisposes you to a real and complete relaxation. All rooms and suites have a balcony and a bathroom with a bathtub. 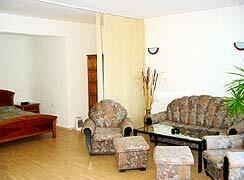 2 of the rooms are furnished with 2 beds, the rest 8 have a bedroom suite. Up to 1 (2) children can be put in every room (suit) additionally. Facilities Hotel and room facilities of Noy Hotel - point the mouse over an image to see the meaning.